This time I thought I would address the often misunderstood question of white balance in photography. Why sometimes when you take a photograph and it appears on the screen or on your computer as a different color to how you saw it when you took the photograph. In this post, I will explain why this happens and how you can adjust your white balance to rectify this. The color of light differs with differing light sources – the light from street sodium lamps is different to sunlight which is different to candlelight. this light is measured in Kelvin and ranges from more warmer shades of red/orange light (around 1000K) to more cooler shades of blue (10-12000K). Regular daylight is estimated to be roughly 5500K. Our eyes have an amazing ability to render the correct color balance for things in different light – a white napkin will look white in front of a candle and outside in the sunlight. Our cameras however are not so good and need a little help. This is where white balance comes in. Although it seems complicated and yet another menu and setting to control with your camera, it really is a pretty straightforward thing to change and doing so will help improve your color accuracy in your photographs. Adjusting the white balance settings will help your camera record neutral colors that reflect what you see with your eyes at a particular scene. 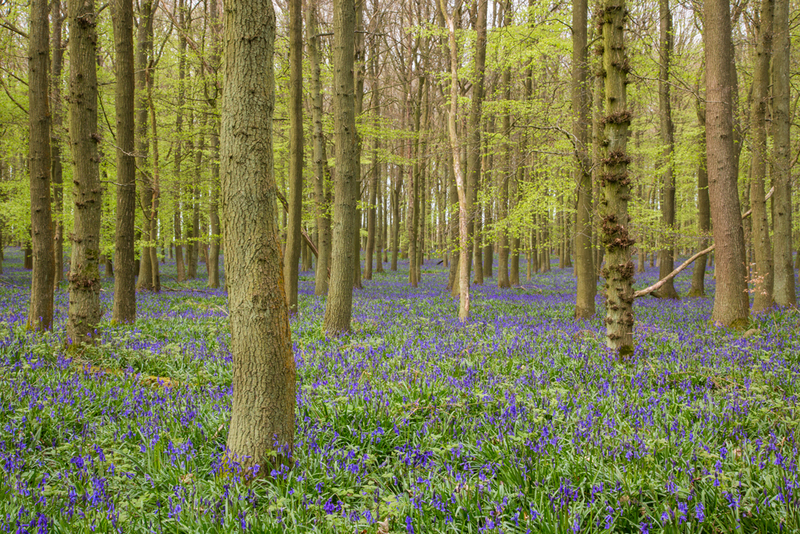 The following image is a scene of the beautiful spring bluebells in an old English woodland. 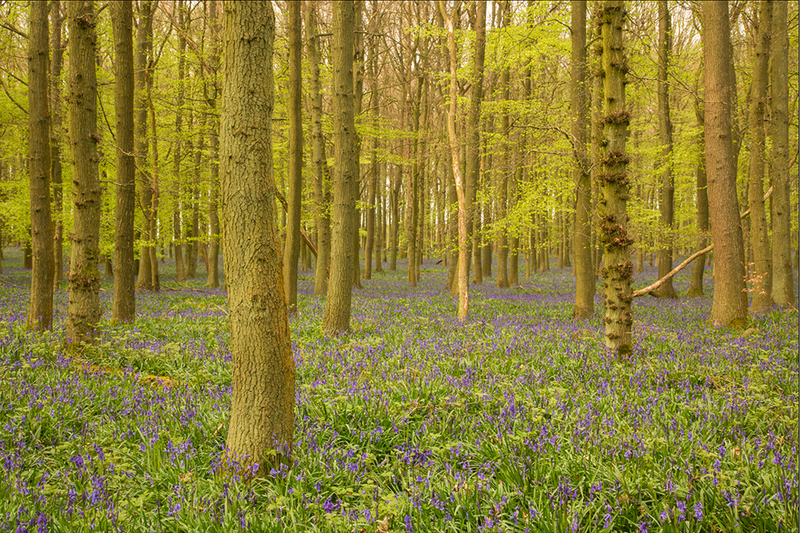 You will notice that there are no actual blue bluebells and the whole image has a yellow tint and the colors are completely wrong. The next image below is a correct representation of the scene, with a correct white balance and here you can see that the camera has recorded the colors accurately and pretty much as my eyes saw it. Auto – where the camera evaluates the scene and decides. Note – The white balance control is different to the scene setting that some cameras have that include ‘night scene’ or ‘beach’ or ‘fireworks’ etc. So you can see from the above the noticeable different shades where the camera has been fooled into thinking it is shooting under a different lighting conditions – notably the blue tones of tungsten and fluorescent. So how do we fix the white balance? Now often, having your camera set to auto white balance is enough for pretty accurate color representation. However, there are times when your camera is fooled and its then that would want to ensure that you select the appropriate white balance for the lighting of the scene you are shooting. One way as mentioned above is to select the correct option from your cameras settings that suits the lighting for the scene you are shooting. However, an alternative is to set a custom white balance where you select something that is know to be white and and tell the camera that this is close to true white in the scene you are in and the camera will work out the correct white balance for the image. Obviously whilst this is a great feature, often in a scene there is nothing true white in which to use as a basis of the choice and this will entail carrying a white balance card which you can place in your scene to photograph and setup the correct custom white balance prior to taking the final image. The final option, and one I use and strongly urge you to do, is to shoot your photographs in raw format. I will do post on the benefits of raw files but for this post I will briefly mention that a raw file records ALL of the white balance options data when you take the photograph so you are able to switch between any of these in your post production software. One last thing to note is that sometimes it can help enhance the colors and saturation of your photographs to select an alternate white balance – the most common example of this is when shooting sunsets and you want to add in additional yellow hues to emphasize the colors. It is worth experimenting! 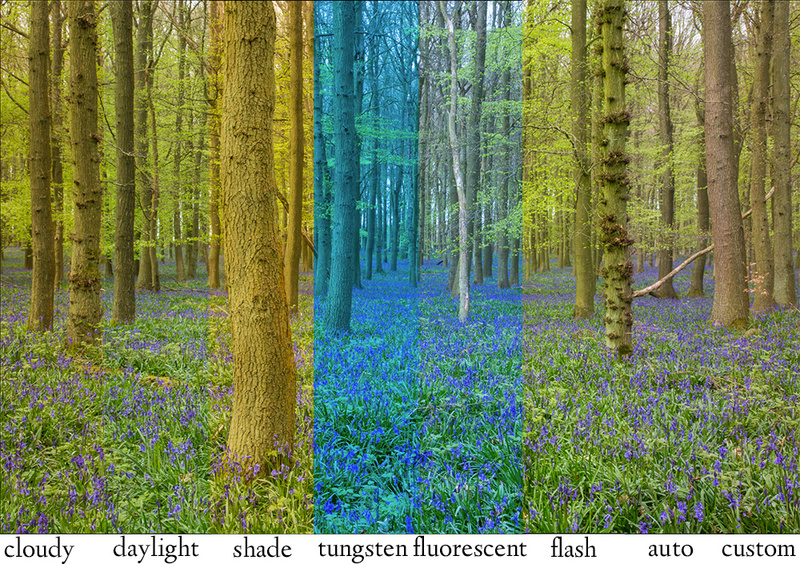 I hope this provides you with a clear explanation on white balance. Please feel free to contact me if you have any questions or comments about this post (or anything else on my website), and to pass this tutorial onto any photographer friends you think may benefit from it.